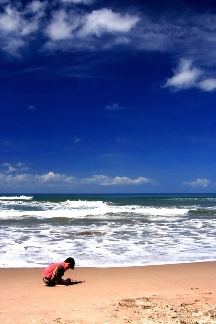 What can you expect in Pelabuhan ratu, one of the fine beach along the south coast of Java? Imagine the breathtaking beauty with hills, mountain and sandy beaches, set against the deep blue Indian Ocean. Formerly just a small traditional fishing village, has grown into beautiful holiday resort, especially for people from Jakarta who wants to escape from busy and crowded city. Also because this place is not too very far from Jakarta, only three hours drive. This is mainly place for hiking, there are magnificent rocky cliffs along West Java’s deserted southern coastline, and deep river gorges and caves. There’s also a fine beach but the crashing surf can be dangerous. Swimming off most of Java’s south coast is dangerous. Don’t wear green or red colour on the beach or in the water because these are colours of Nyai Loro Kidul, the goddes of Pelabuhan Ratu who takes fishermen and swimmers who wears green or red into her watery kingdom. There is one four star hotel, the Samudra beach hotel, about 6 km from Pelabuhan Ratu, a modern hotel with several restaurants and a good swimming pool. Samudra Hotel has a room that kept unoccupied for offerings to the Queen of the South Seas. The beach is also the scene for annual Sea Festival in April which the fishermen sacrifice a buffalo head to the sea and scatter flowers on the water. Five km to the west of the Samudra Hotel, at Pantai Karang Hawu, there is a towering cliff with caves, rocks and pools which were created by a large lava flow that pushed over the beach. According to the legend, it was from the rocks of Karang Hawu that Nyai Loro Kidul leapt into the mighty ocean to regain her lost beauty and never returned. Further west, near the fishing village of Cisolok, there are hot springs. There are enough small hotel and cottages around the beach. Like Bay Armta has basic but comfortable bungalows perched on the edge of a cliff. Or try the ‘Fish Restaurant’ a popular place and its attached restaurant has a reputation for excellent seafood. Not so far from the beach, there is also beautiful national park, the nature forest of Mount Halimun Salak, located between Sukabumi and Bogor. Worth of visiting.